In the "olden" days, I used to keep records of some of my longer trips on scraps of paper or on notepads carried specifically for that purpose. 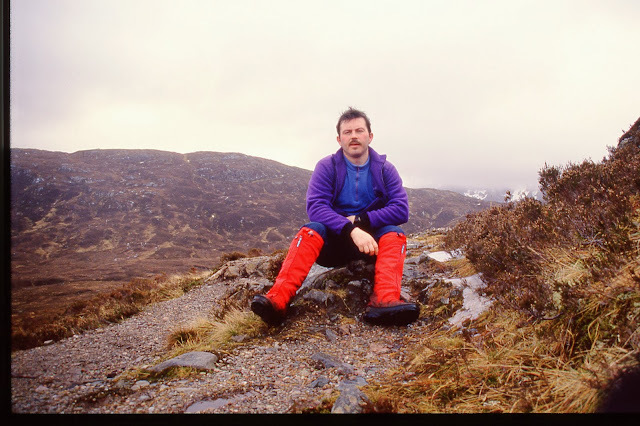 I recently discovered my trip notes from a walk on the West Highland Way in March 1993 and so thought I'd transcribe them here for posterity. Having looked them over, I'd just warn that they are extensive and often very detailed. Perhaps worth saving for a long, boring night shift or a bout of insomnia. I've typed them in just as I'd written them. I'll not pass comment on my grammar, use of language or opinions other than to point out that this was 20 years ago. 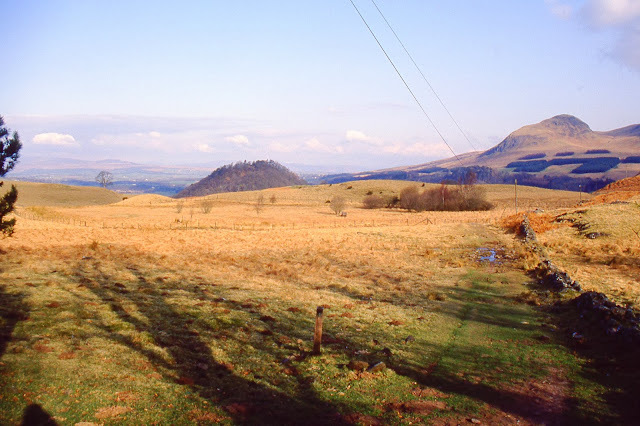 Mon 1st: Milngavie to Balmaha. 18.5 miles. Well, this morning didn't start too well. A 5:30 alarm call is not the best way of starting out on a six day walk. That plus the rush and panic to make the various connections keeps the worry going. As it was, I made it to Haymarket in plenty of time and ended up on the 6:52 rather than the 7:00. The other result of the early start and the late night was that by 12:30 it felt like tea-time! The walk starts nicely enough. Once out of Milngavie it's really quite pleasant through Mugdock Wood and past Craigallion. 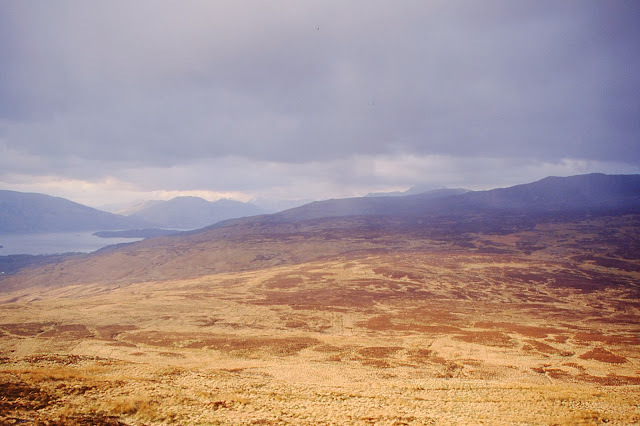 However, the early highlight is a crossing of the B821 and the view that opens out over Dumgoyach. I had to take a photo here, though it must be one of the most photographed points of the whole Way. By the time I reach the railway my feet were feeling a little bit tender. I stopped at Dumgoyne to put some Second Skin on my left heel. I think the new footbeds are causing the trouble. Up to here, the theory of frost causing the ground to be less muddy seems to be holding up. I must admit to being slightly surprised to be the only "walker" on the train. However, one dog-walker who spoke to me said she'd seen a party yesterday. I can only hope that they're far enough ahead that the path has a chance to recover before I hit it or that I catch them up somewhere. 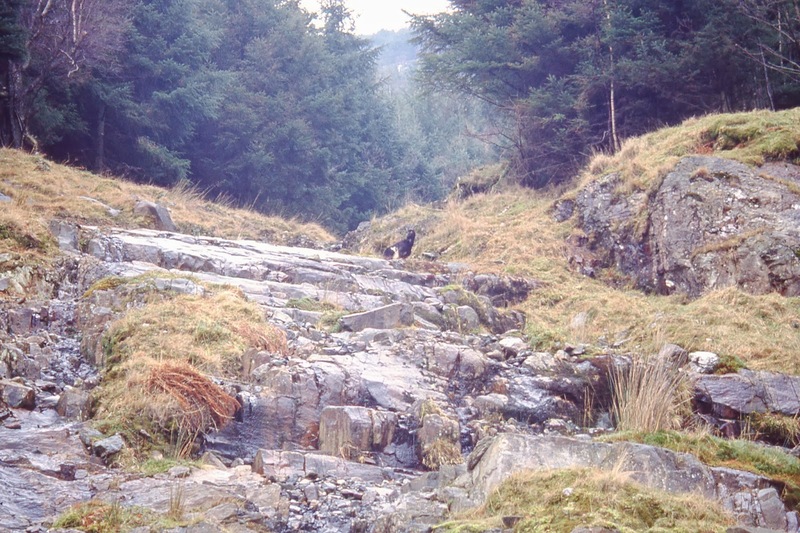 The path did, however, start to deteriorate after Dumgoyne as it follows the old railway. Gartness is a lovely little group of houses with interesting rock formations in the river below. 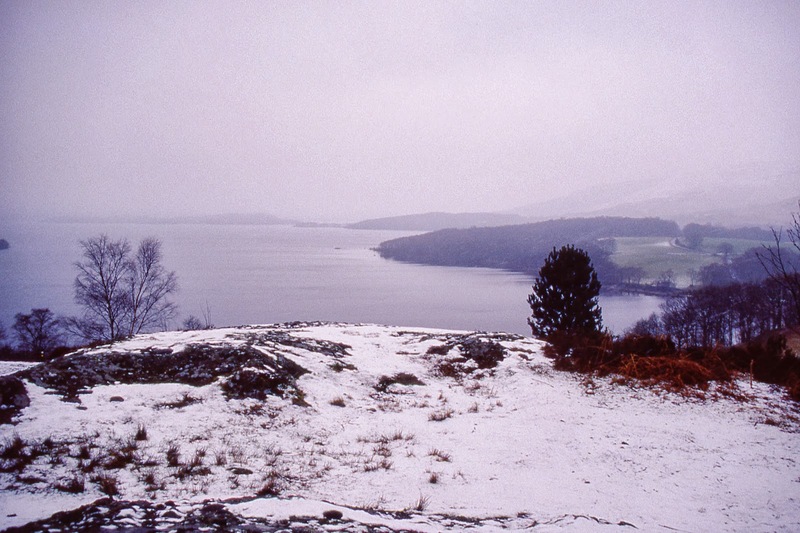 I seem to have made good time till now but the view from here of Conic Hill is a bit off-putting. By the time the Drymen road is reached I would have been quite happy to have stopped. The path from Drymen through the forest at Garabhan is the most boring part of the walk so far but when the path crosses the huge stile at the forest end it's suddenly like being in the "true" highlands. I stopped off for tea at 15:00 with a view over to Conic Hill. This was the first time I really thought that Maureen should have been with me. It was that time of day when we both like walking but still warm and relatively windless. I decided to get the second ski-pole out here and wished I had done so earlier. In fact, the walk up Conic Hill seemed to go in very easily. I got a couple of photos off here, including one of Ben Lomond which had been around my field of view all day, Strange to think that I'll be passing the foot of it tomorrow. As a marker of time, it's unlikely I'll see anything else 24 hours away for the rest of my trip. Balmaha is nice, if a bit "closed". The B&B is great, all home comforts plus a family of six kids. Lucy and Sandy are also very hospitable and I managed to get a meal, despite being a vegetarian!! Quite a few blisters at the evening count. I've decided to change the footbeds tomorrow back to the originals. Hopefully, the extra room at my toes will ease those blisters and the plainer shape at the heel will ease those. I'll have to risk the extra "shock" without the Sorbothane though there's little tarmac tomorrow. My right thigh is also a little sore which is a new worry. It seems these walks are good at developing new problems!! I'll take a Voltarol tonight in case anything starts playing up. Well, the day certainly started with promise. A quick look out the window at 8:00 showed a white field and snow still falling. Breakfast was everything - cereal, juice, coffee and a good fry-up. I took my time, being in no hurry with only 14.5 miles to do today. The various blisters seemed OK and no real pain experienced anywhere. I eventually left at 10:00, chancing no waterproofs - this turned out to be hopelessly optimistic! After the direct routing of yesterday (well, up to Drymen at least) the route today seemned to choose diversions just for the sake of it. The final straw was RossPoint/Ross Wood where the Way goes over the highest point regardless of the fact that there is no view whatsoever! Although I knew the Way would be quiet I was surprised to see all the campsites and shops closed. Speaking of quiet, I caught sight of some footprints, freshly made in the new snow. Two people heading north, but who knows how far up ahead they are. I passed some workers just south of Ross Wood and had a chinwag. The shock was that, as I left, it was 12:00. This meant that, regardless of how I thought I was going, it was definitely too slow. My mood as I went over Ross Point was not good and wasn't helped by a large treefall which necessitated a small diversion out to the main road. On the positive side, this helped make up my mind about the choice of routes after Ptarmigan Lodge. The time loss and the wind-falls would make it impossible to reach Inversnaid before dark. Reaching Rowardennan, after yet another "scenic detour" was a relief. I found some shelter beside the toilet block which meant I could air my clothes for a little while. I also passed a couple of walkers by the hotel though, as I was head-down into the rain, I didn't pay them enough attention to discover whether they were heading north or south. Rowardennan was another "Mim-moment" as I finished off the rolls she'd made up. She wouldn't have liked today at all due to the rain. The easier route past Ptarmigan turned out to be a forest track with 800ft of ascent but I was still glad to make up some time. At 15:00 I caught sight of the footpath again and joined up with it a couple of minutes later - at which point I also caught sight of my first goat. I stopped at this point for tea and the rain also stopped for a while. The footpath was OK as far as the cottage at Cailness and I was confident of making Inversnaid in good time. Such confidence turned out to be unjustified as the path became a nightmare. I actually started to think I'd passed the hotel though I knew this would be impossible. It was after 17:00 when I finally caught sight of the lights at Inversnaid. I knew this was some kind of punishment for finally beginning to think I might complete the whole walk! Inversnaid Hotel is a funny place - not helped by the level of disorganisation apparent. However, I did manage to get a room instead of a place in the "dorm" as the dorm was full of bits and pieces. This was a pleasant surprise as I'd already been considering a room. Turns out there are another 200 guests staying - the owner has a whole organised coach tour system going. After a couple of pints I eventually retire for a shower before returning for a bar meal. It was real SAGA Holidays stuff in the evening with the wrinklies all recounting past glories- god knows what they saw from a bus today with constant drizzle and a cloud level less than 500ft. Past Rowardennan the whole Way takes on a more "highland" aspect - there are more hills and the loch is narrower. In fact the traffic is often less than one mile away. This was especially frustrating in the final section to Inversnaid as the sound of any car made me think the hotel was just around the corner. I'm not sure what the other hotel residents made of me - the dress code was definitely shirt and tie. I'm sure they thought I was a poor walke, having a bar meal while they ate in the restaurant. Classic wine-buying "I'd like a German wine please" - if only they knew how much choice that could mean. Wed 3rd. Inversnaid to Crianlarich. 14 miles. Felt healthy enough in the morning and went down to breakfast at 8:00. Just as I was sat down I looked out of the window to see a beautiful blue sky with the snow-covered fills opposite. This made me dash upstairs for my camera - amazing considering how my muscles felt! Breakfast was a bit strange in itself. The other guests were treating me like a leper as the filled up the room. I set off at 9:00 after using the kettle in my room to make up a flask. I was of course apprehensive given the comments regarding the state of the path from Inversnaid to Doune Bothy. This turned out to be unfounded as it was nowhere near as bad as the mile south of Inversnaid. I made Doune at 11:00 as forecast and stopped for lunch at Cnap Mor. Despite the slow rate of progress I was beginning to grow in confidence, even starting to think ahead to Fort William. I took a photo of a train as it passed along the other side of the valley. 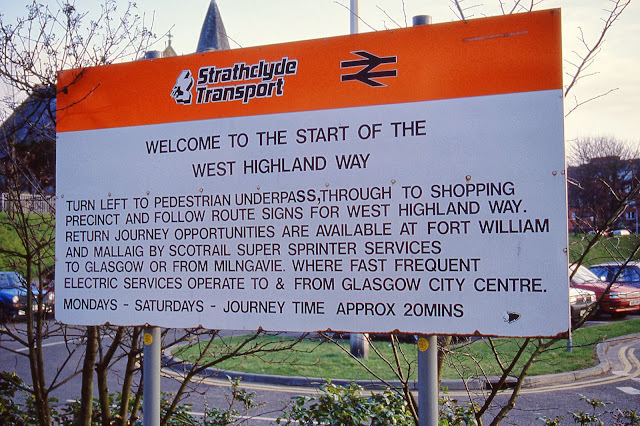 I'll be with the West Highland Line from now until Bridge of Orchy. 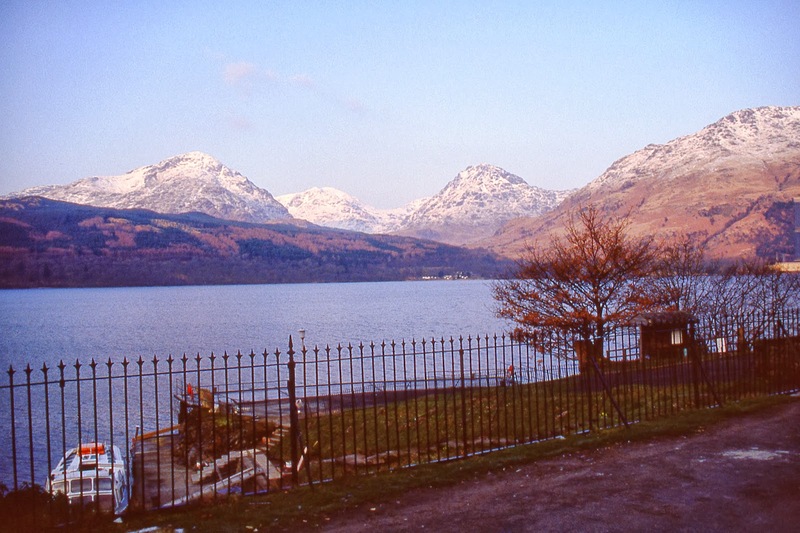 I also left Loch Lomond behind which is a sort of landmark given I've been beside it for the last day and a half. I also got a couple of photos of a RAF Hercules which was flying along at about 350ft. Sandy should be interested! So confident was I now that I was even considering going past Crianlarich and on to Tyndrum tonight but there seemed little point as it not result ina quicker finish. The run along Glen Falloch took a surprising amount of time and effort and I found I could not better the 2 mph average. This is worrying, if only for the prospect of the two "big" days to come - especially Inverarnan - Kinlochleven. I had to get the map out and try to work out a rough schedule for those days just to comfort myself. 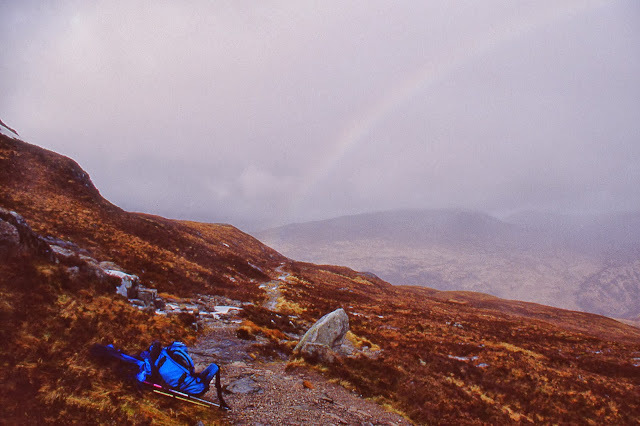 The weather stayed fair right up to the end and I was still smithering about carrying on to Tyndrum when I reached the spur to Crianlarich but decided that, at 15:45, it was time to find a bed for the night. It turned out to be a lovely evening right up to 18;00 with a rosy glow in the west. To say I was kicking myself would be an understatement! The hostel is OK, with only three of us booked in. One guy came from Rowardennan today! The choice of food available at the hostel was a little disappointing - not helped by me being vegetarian - and the only shop being closed for a half-day. However I got enough to stock up on calories and can get down to the shop for 8:00 tomorrow for breakfast. I also took a trip down to he local hostelry for a couple of pints and to watch the match. The locals were very friendly given it was a locally sort of place. An early night for once as well, with lights out soon after 10:00. Thu. 4th. 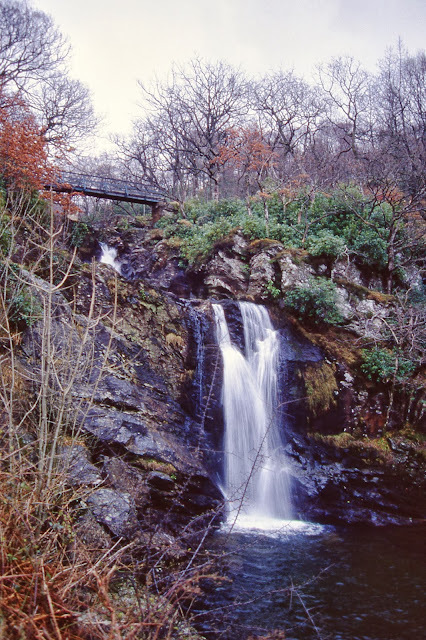 Crianlarich to Inveroran. 17 miles. Despite, or maybe because of, the early night, I was quite restless and woke up at 1:30 thinking it must soon be time to get up. After a trip to relieve the bladder I got back to sleep but kept waking up throughout the night. Breakfast was another case of "make do" with some cereal, fresh milk from the shop and a roll with Philly This also gave me a packed lunch along with some fruit juice. I set off shortly before 9:00 with the Welsh chap just a few minutes behind me. The walk through the forest was lovely, one of the best parts so far, but the weather was getting duller and duller all the way to Tyndrum. My feet were also causing some concern, particularly toes 4 & 5 of my left foot. I stopped at Tyndrum for a breather and bumped into Donald from Merchiston Mews. 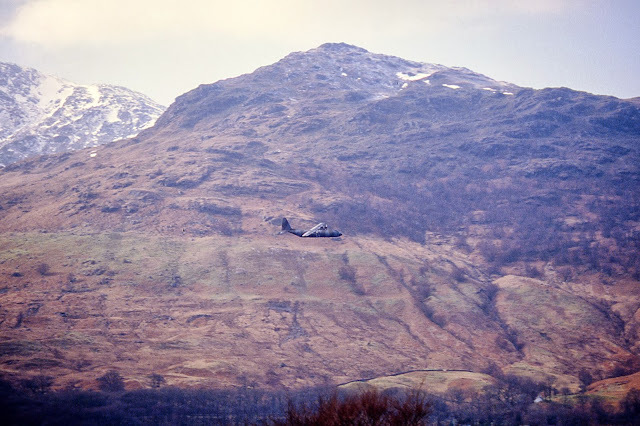 He seemed quite astounded about the whole idea of walking from Milngavie to Fort William. I also tried to get some sort of local anaesthetic for my toes but the local shop was unable to help. I did, however, get a spare film though, in light of the weather (it was now sleating), this seemed overly optimistic. I stopped on the way out of Tyndrum to don waterproofs and apply some Second Skin to toe #5. This was a job in itself and I ended up with three pieces of Micropore trying to hold it in. It was good to be walking a section of the Way I could recognize from the road - it helps make up for all those other times I've seen walkers from the car and I've wished I could be them. I thought that I would have been overtaken during my stop in Tyndrum but, as the path unwound, there was no sign of anyone ahead of me. I'd been going as hard as I could sustain and had managed to improve my rate of progress, 7 miles in 2.5 hours. However, it was still necessary to keep up the pressure as, leaving Tyndrum around 12:30, there were still 10 miles to go. 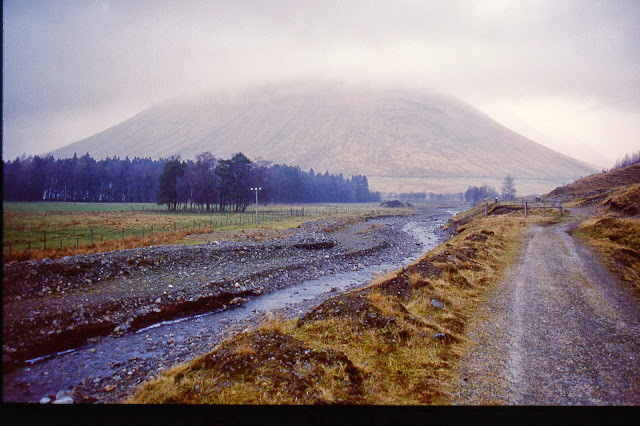 The first few miles to Bridge of Orchy were lovely, with the whole glen unfolding down to Auch Farm. The next few miles became a bit of a trudge until Bridge of Orchy eventually came into view. I had planned to stop here for tea but the lack of shelter, the noise of roadworks, and the general dismal air made me carry on into the forest a little. There was still no shelter but I eventually found a rock to sit on and had my coffee and a couple of rolls. I noticed that when I stopped the first few steps were extremely painful and was not looking forward to starting again. As I was putting my sock on I noticed the Welsh chap coming up the path behind me. We walked together for a while but he shortly decided to let me go on ahead. I think my short break had given me a new lease of life and I fairly sprinted up the hill. As recompense however, I could feel my left ankle straining slightly on the way back down. I might therefore have to wear some Tubigrip tomorrow. I only hope this does not come to anything and doesn't cause any additional blisters. Another milestone today was passing Bridge of Orchy where Katrina and Alex had given up. The Inveroran Hotel is a little spartan (but is only £12.50 a night). By being first here I was able to commandeer the shower so I could get into some dry clothes. Another thing about the hotel is the number of signs saying "do this" / "don't do that". It's not exactly the most welcoming of atmospheres, not helped by a bar that doesn't open until 18:30 and breakfast not served until 9:00. As I was after an early start tomorrow I'll have to arrange for breakfast on a tray and make up for it at Kingshouse. I was thinking about the trip home today, looking forward to seeing Mim at the station. I can't make up my mind about Sunday though. Half of me says "do something energetic - don't let all this good work go to waste". The other half says "have a nice relaxed day doing sod-all". I'll probably let Mim decide (I'm sure she said last night she was off on Sunday). Dinner was OK again and a couple of pints of cider helped round the evening off. As I was going upstairs I decided to phone Mim only to find the line engaged - turned out she was phoning me! Unfortunately her call had come through to the bar and I couldn't really talk with all the attention. Hopefully there'll be more time for a chat tomorrow. Fri 5th. 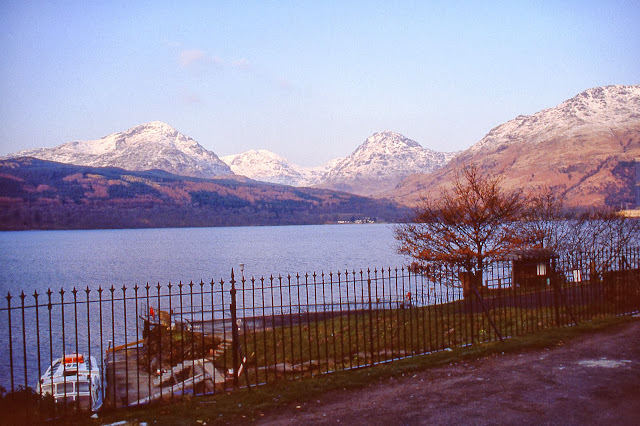 Inveroran to Kinlochleven. 19 miles. The "early" breakfast was a bit basic but I had what there was and set off around 7:45, only to find a constant drizzle settled down round Rannoch Moor. The moor road was certainly well surfaced and I seemed to make good time. Unfortunately, the pains of yesterday quickly reasserted themselves, though I had taken the precaution of wearing the Tubigrip on my left ankle. I had noticed that Andrew (the Welsh chappy) had set off before me and I caught sight of him as I came to Ba Bridge. The views from here must be stunning on a good day (I guess that means I'll have to come back). The road takes it's time in unwinding over the moors and it's a relief when the monotony breaks and first the White Corries ski-tow (working today) and then Kingshouse come into view though the latter still takes some reaching. I crossed the A82 again (8th time in 3 days) and was glad to get my boots off and a cup of coffee. Lunch (or any food) was off however as the workmen had somehow managed to knock out the electricity supply to the kitchen. The staff weren't exactly overwhelming in their hospitality. I would have thought a sandwich could have been little trouble. I also caught up with Andrew here but I was in no hurry to leave and sat about for a good half hour relaxing while he hit the road. The restart was painful, as expected, but I still managed down to Altnafeidh within the hour. I also stopped here for the remaining roll I had over from the day before as my stomach was making it obvious some sustenance was required, I also had my coffee here, which was earlier than planned, and wished I'd saved it for the top of the Devils Staircase. The walk to the top of the Staircase was a bit of a struggle (as I had expected) and wasn't helped by a steady drizzle which necessitated the full waterproofs. By the time I reached the top the sweat was dripping off me but all the effort seemed wasted as there was no view to speak of. Coming down the other side, the tip of my new ski-pole snapped off! I think it's because the basket I had fitted was slightly too small and had caused some flex. Crossing the Devils Staircase was another of those milestones. All I could think of now was that with a short drop to Kinlochleven and the Lairig Mor left, I was almost guaranteed to complete the walk. However, that's still 20 miles - enough time for something to go wrong. I stopped for some juice and took a couple of photos, including a self-portrait- and was surprised to hear some voices behind me. It turned out to be two guys who had parked their van at Altnafeidh and were planning to go back over to get it. By my calculations they would have been lucky to get back before 19:00! 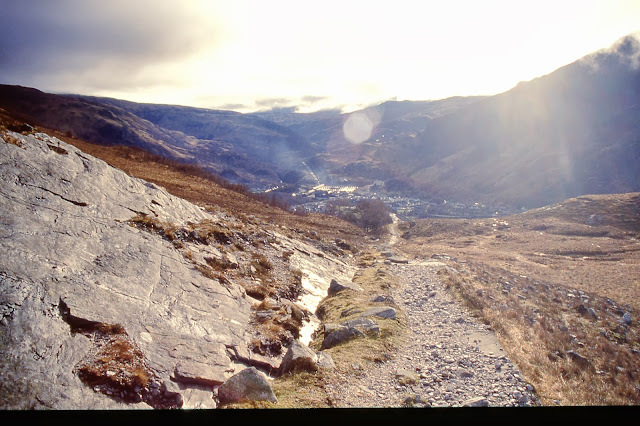 The track down to Kinlochleven seemed to take forever, with lots of ups and downs and hairpin bends to contend with. I was surprised to see a notice board at the top of the pipeline from the Blackwater Reservoir advertising a "proposed tearoom". There were two buttons on it(bell pushes) - one for "Yes" and one for "No" and they were asking all passers-by to say whether or not they would stop here if said tearoom was opened. I pressed "No" on the basis that it was too close to Kinlochleven (on reflection it might have been a good idea). My other thought was that they would only be able to make such a thing pay if the track up was open to the public motorist. Having now walked down the track I think I can say there's not much fear of that happening! 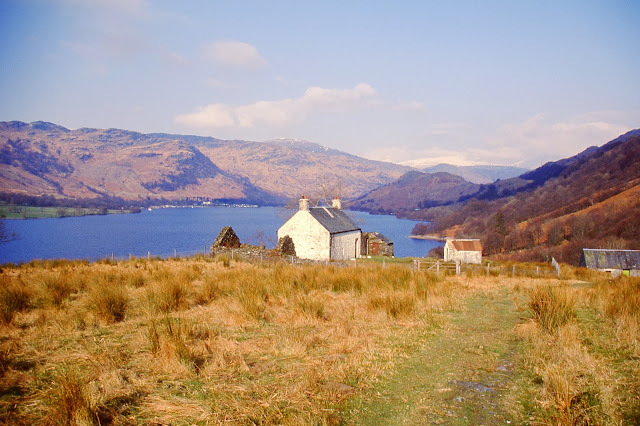 Kinlocheven really is an eyesore, if anything, worse from the WHW. At least in a car the worst bits are hidden and you're through it quickly. My B&B turned out to be the furthest away and I'll have to re-tread ny footsteps tomorrow. The family are friendly enough though and I was able to enjoy the luxury of a bath. Strangely, in light of the hunger I'd been experiencing all afternoon, I could hardly eat dinner and had to turn down dessert. All thoughts now are of tomorrow and ensuring I make it to the station in time. The weather forecast seems reasonable and I'll take another Voltarol tonight to ward off any additional pains. I hope Maureen doesn't want me doing too much on Sunday and my feet get a rest. Sat. 6th. Kinlochleven to Fort William. 9.5 miles. This was the first morning I could really have stayed in bed. Perhaps it was weariness or perhaps the knowledge that this would be the last day. I had woken up thinking of how I would feel having complete the Way - such was my confidence. In reality, I knew that if I could at least get to the Lairig Mor watershed then it would, regardless of circumstance, be easier to carry on to Fort William than to turn back. I left the B&B after 9:00 and stopped off at the newsagent for some juice. Ironically, the morning weather looked good and I thought that the remaining cloud would soon burn off. I certainly had the sun on my back as I struggled up the old military road and, for the first time, ended up walking without my fleece jacket. 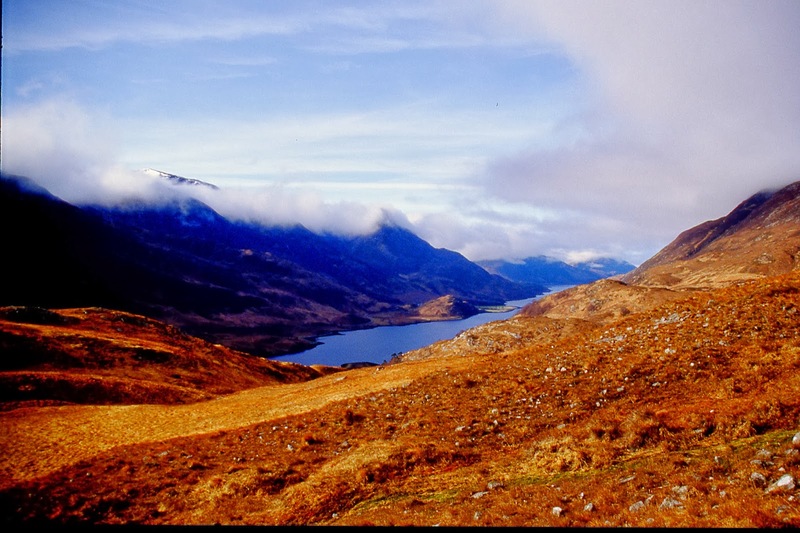 Kinlochleven looked very out of place with the hills, sky and loch and I got a couple of photos show its absurdity. 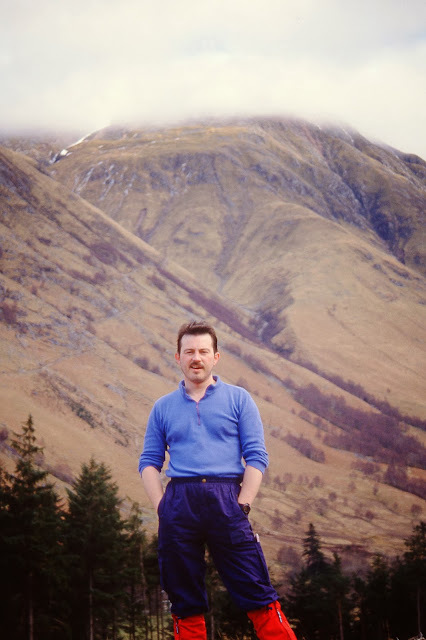 When I reached the Lairig Mor it had got cloudier again and I was now walking into a chilly breeze - time to don more clothes! I was counting off the miles now, each one rapidly counting down to Fort William. I was also keeping an eye on the clock as I didn't want to miss my train. I'd stopped for a little rest when first a mountain biker (the first I'd seen all week) and then a Land Rover came past. I'd thought I was hearing things when I first caught the sound of its engine. I'd stopped for another break at the end of the public road (only 4 miles to Fort William that way) when another walker came along. Turned out he was from Dingwall and was practising for a 62 mile weekend in May. We walked on together, though he was obviously going faster than I had been and I found it useful to use him as a pacemaker. The last section down through the forest to Glen Nevis seemed interminable with only occasional views to a (cloud covered) Ben Nevis to break up the horizon. One last lot of steps up a steep slope almost killed me off but this was, finally, the last climb of the Way and the path joined a new (and therefore unmapped) forest road to Glen Nevis. In spite of all the guides and maps, this is the last official signpost on the Way, still 2.5 miles from Fort William and we were left with a trudge along to Nevis Bridge. It's rather an unfortunate way to end 95+ miles. We found a pub for a celebratory drink and watched Scotland lose out to England. Thinking back on the whole walk, it would take a minor miracle to make me want to do it again - too many unscenic trudges. There were, however, many sections which would be nice to re--visit. There were definitely times during the 6 days when, had the walk been a longer one, I would have considered abandoning. This was especially so on the second day when I had to get through the forest to Inversnaid on somewhat tender feet. The weather was, on the whole, pretty average for the time of year. Highlights were the cold , crisp first day and the snow on the morning of the second. The choice of walking in February/March turned out to be the right one as the walk was neither too crowded nor too muddy. The walk also gave me time and experience regarding equipment and I certainly learned a lesson from the footbed problems. Using B&Bs was also a new departure with both pros and cons. While it was nice to have a lighter pack, having set meal times and another persons disciplines to follow took away some of the freedom which a weeks backpacking gives. I'll certainly use B&Bs/hotels in future but more likely as an addition to, or break from, camping. Camping would also have made the whole walk more flexible and would have prevented the need to rush certain sections in order to reach accommodation by nightfall. The little Footprint guide was excellent as a reference throughout, especially in having the miles pre-marked. I'd like to copy this idea for any future walks by making up my own. Of course, due to the time of year, much of the info. on shops/cafes etc. was irrelevant. I joked with the Dingwall guy that the planning was half the fun. This isn't too far wrong and echoes the writings of other walkers. I suppose the trick is to ensure there is something so show for all the planning. Futures: Fort William would be a good starting/ending point for many better walks than the West Highland Way. The Great Glen Way would be good to do before it becomes official; a walk through to the West Coast "proper" such as Knoydart or Mallaig would be a good walk; there are many Rights-of-Way which cold be linked to form a good stravaig. One lesson from the WHW is that loops and detours can make a significant difference to a point-to-point course yet still maintain a general direction and a closeness with civilization.